Giants like Netflix and Spotify are well versed in the customer personalization game by now, and more and more companies are hopping on the bandwagon. 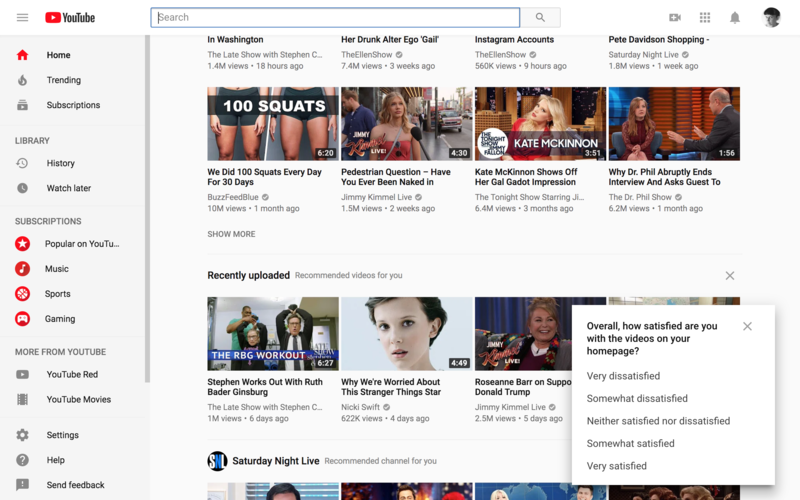 YouTube has done a great job in this effort and has made moves to further personalize their homepage for each individual user. To make sure they are on the right track, YouTube places a 5-tier NPS survey at the bottom right of a user's dashboard. YouTube waits for the user to scroll down their homepage, an indication that they are browsing through the sections, before this survey pops up. The timing hits users as they are forming opinions about the videos they are scrolling through. The copy and design is straight-forward and to the point, causing minimal interruption or work on the part of the user. They can answer and easily move on, or opt-out.